Yesterday I had my second ultrasound. It went great! Baby has nearly doubled in size from 10 days prior. Still measuring 5 days ahead! And with a beautiful heartrate of 166. 🙂 Thank You so much dear Lord! Please continue to bless this pregnancy. In Jesus’ name. I seem to be starting with a UTI despite daily suppression with Macrodantin. So the Dr switched me to Macrobid for a week. Since I’ve been released from my RE’s office, I have to find an ob. I am very hesitant to go back to the practice that delivered both of my boys. On the one hand, they are familiar to me and I’m mostly comfortable there. But then, Levi’s birth was a huge hours long battle between me and the ob who just couldn’t comprehend an uncomplicated natural vbac. She pressured me for hours to get an epidural (Nearly shouting “Get the EPIDURAL!” at me) even though I pacified her by getting the line placed sans meds. I wasn’t in enough pain at that point to want the meds and the only reason she wanted me to take the epidural was so she could speed up my already great labor with pitocin. In the end, and only by the grace of God, I avoided another dose of pitocin. After the birth, the Dr pulled on the umbillical cord trying to remove the placenta just seconds after I delivered the baby. I begged her not to but she continued. Whether that caused the placenta to tear and then become a piece of retained placenta followed by hemorhage or not, who knows?! But it didn’t help. I almost lost my uterus. They were this close >•< to doing a hysterectomy to stop the bleeding. The best part? I have it all on video. So all that to say, if I go back there, I’ve requested a different Dr for my primary. But here’s the thing, that is an MFM group. And aside from taking blood thinner, I’m certainly hoping that this pregnancy is not going to be high risk. I’m not sure how I’ll handle my anxiety if I go to a regular ob practice though. I probably won’t get nsts or growth scans or afi checks. And if you remember, we found out Tru was in distress at one of my nst/afi checks and delivered him via c-section right away. So going without that will scare me, because it could have gone completely different without that appointment. But on the other hand, if I find a compassionate dr, I’m confident that we can work together to find something that fits for us all. And the bottom line is just placing my trust in God. 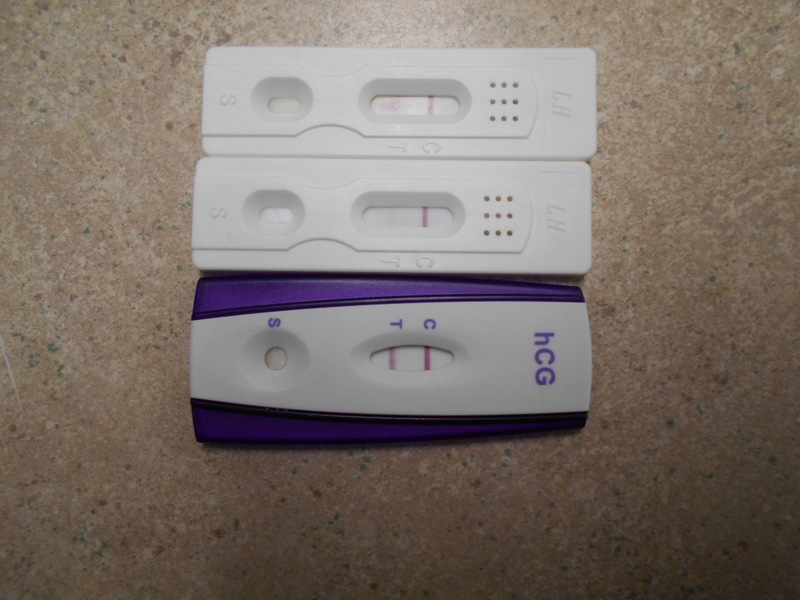 That He will make sure we get any testing we need and provide for a safe, healthy pregnancy and birth. SO, today I scheduled an appointment with a regular ob. This time, when/if I’m met with ignorance (as I have been in both previous pregnancies) and am told to stop my Lovenox, I have my wonderful, knowledgable hematologist to back me up and say that it is absolutely neccessary!! She will gladly send them a letter confirming that my combo of clotting disorders makes treatment a no-brainer. BUT, because I’m afraid this regular ob may not work out for me, I also called the MFM group to set up an intake appointment. The descision remains to be made until after my first appointment with the regular ob in 2 weeks. If we click and I love them, I just might stay there. They deliver at the hospital I had the boys at which is an absolute neccessity because that hospital has been so wonderful to us in the past. Very pro-family and focus on keeping mom and baby together. They are also very helpful with breastfeeding etc. 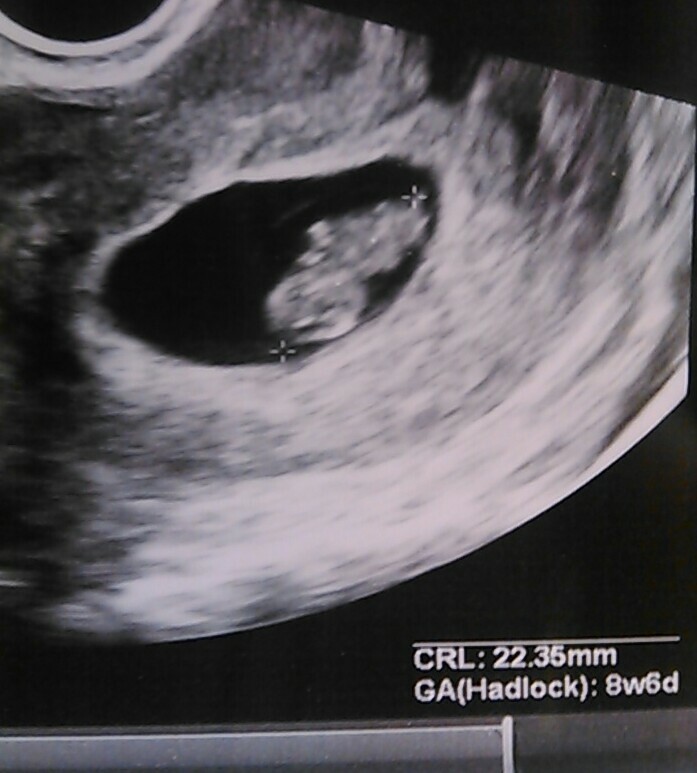 I had my 2nd pregnancy ultrasound yesterday at 8w0d. Our precious baby was measuring 8w1d and had a heartrate of 166bpm. It was so cute! It looked so much more like a baby now. So after all our measuring and listening, the RE said “I saw another sac over here.” I had noticed it too this time and at my last u/s. I didn’t know for sure if it really was a sac and the RE had double checked and not seen it. He kept saying “How did we miss this?” There was a baby inside but it was small. Maybe 6 weeks and sadly it had no heartbeat. It was sad to see it on there. Then the RE said “How many did we put in there?” I reminded him that we had transferred 3 and he said “well here’s another sack!” Unfortunately, this one appeared to be empty. So we had 2 vanishing triplets. This of course adds a little to my pregnancy worries, but it was thrilling to see our beautiful baby looking so big and happy. We could see the bloodflow to the placenta and the cord. The cord looked huge to me! I could see the heart pumping too. Thank you God, for the opportunity to hear and see my precious baby yesterday. Please continue to bless us and I pray that I will have a safe, healthy pregnancy with this beautiful little life inside me. In Jesus name, amen. I have been severely neglecting this blog because I don’t have a whole lot to post about right now. Last week was pretty good. I spent most of it laying on the couch being quite nauseated with morning sickness. Then Friday came and I felt much better. I also felt a lot better on Saturday. After feeling so sick all week, getting so much better so quickly made me nervous. Sunday came and I was feeling pretty sick again. Now here it is Monday and I’m back to being just a little bit blah. Oh the constant confusion! The good thing about being sick last week was that it took away from my time to worry! I worried soooo much less. But yay because 2 sleeps until my next ultrasound! Hopefully my little baby will be looking adorable and growing perfectly fine with a wonderful heart rate! Please God!!! My ovaries must be deflating because my tummy is definitely going down. I can almost fit back into my regular clothes for the first time since finding out I am pregnant. If everything looks good at my ultrasound I’m planning on buying a Doppler so I can listen at home. I probably won’t try using it though until closer to 9 or 10 weeks. See, I told you I have nothing interesting to report…. As far as symptoms go, as I said I have very come and go nausea. Mostly go so far. My tummy is flatter, I still have some cramping, and I can now feel the top of my uterus but probably only because it is extremely forward tilted. I worry but mostly on the days I don’t feel pregnant. I enjoyed last week because it was so easy to believe the baby is alive and well. Plus I got to eat a lot of popsicles because it was almost the only thing I could get down. DH has been working on the nursery getting the walls patched and ready to paint. He is immensely excited about the baby and seems to be having a lot of fun preparing. Honestly, I’m still too nervous to get as excited as he is. 😦 Screw infertility for stealing my chance of enjoying pregnancy! I am working on it though. And frequent ultrasound appointments do help tremendously. Thank you God for this baby I’m carrying. Please help it continue growing and being strong and healthy. We love it so very much. Please protect us according to Your will. In Jesus name, amen. I had my ultrasound today 4 days early due to pain and cramping. I’m pretty sure the doctor thought I was making that up at first just so I could get in early. (Like who wouldn’t want to see an early ultrasound of their baby?? ;)) But anyways… I am 6 weeks 2 days today and the ultrasound went fantastic. As soon as they put the ultrasound wand in I immediately saw a sack. Surprisingly, by my beta numbers, just one! And 1 beautiful little baby inside of it. I saw the heartbeat before the doctor even pointed it out flickering like crazy at 116bpm. And then he turned on the Doppler and there was the most beautiful sound in the world! I could have cried. I am so thankful. Dh was thrilled. He is so in love. We both are with our gorgeous little baby. The baby was measuring right on track at exactly 6 weeks 2 days. Almost a quarter of an inch long. Everybody was surprised that there was only 1, even the doctor was a little suprised I think. My betas were way more in the triplet range. But it just goes to show that you really can’t judge anything by a beta. I kind of had a gut instinct that there was only 1 because my morning sickness has been so piddly. About the pain… The doctor moved the wand over to take a look at my ovaries. The left looked somewhere around a lemon size, but the right looked like a giant grapefruit!! It looks even bigger than when I was stimulating. So the doctor determined that all the cramping and pain is more than likely due to those giant ovaries. Shewwww!! I was really scared, let me tell you! So we’re not due back for our next ultrasound for 2 weeks. March 15. In the meantime I need to be scheduling an appointment with an OB. I didn’t have anyone picked out yet because I didn’t know if we would be needing high risk or regular so my doctor gave me some names. It still feels really surreal to me to actually be pregnant. It’s so weird to think that there is really a little person inside there even after seeing it on the ultrasound. Journey or Tru? Which one are you little baby of mine? Thank you God, for making my appointment go so well and for letting me see and hear my precious baby’s heartbeat. Thank you for this gift that is inside of me. Please continue to bless it and protect it according to your will. In Jesus’ holy and precious name, Amen.